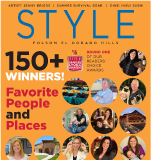 Leonardi has been named a winner as Best Real Estate Agent in Folsom and El Dorado Hills for 2016! "John Leonardi found the perfect home for me and my son!!! I had tough, “non-negotiable” requests and ended up in a neighborhood I love, near an excellent school, and I even got the pool that... continued"